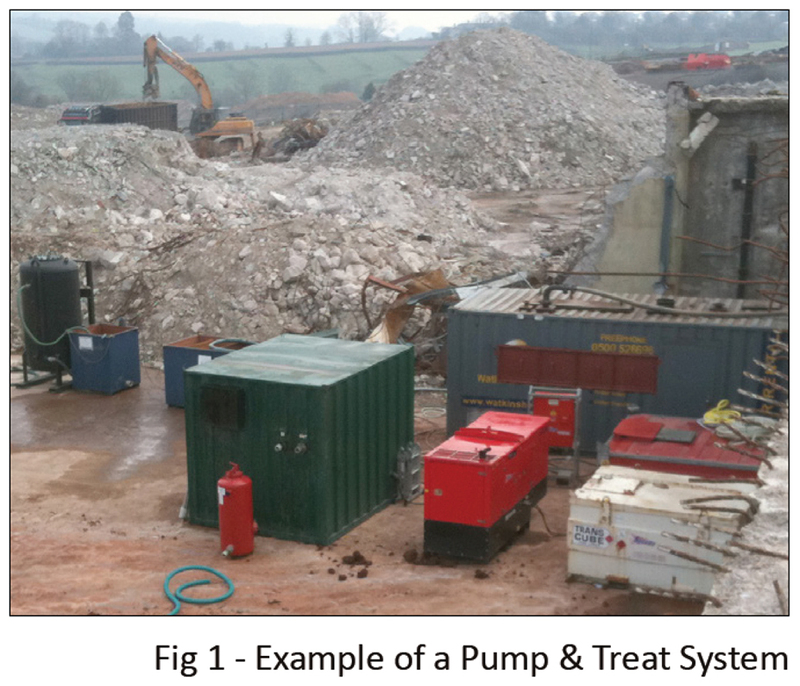 The extraction of contaminated groundwater for treatment and discharge has been widely employed as a remedial tool for years. In many cases it remains an effective way of achieving a rapid reduction in gross contamination within mobile groundwater. 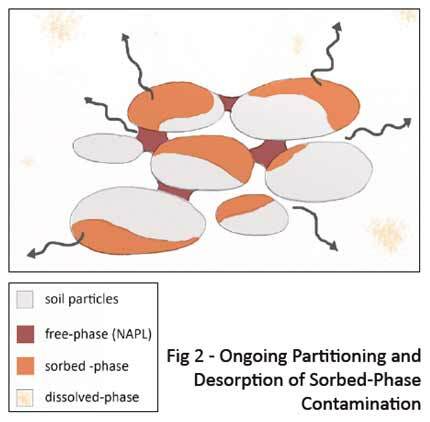 However, it is subject to rapidly diminishing returns; once the recoverable mass is removed, physical abstraction struggles to address adsorbed contamination in source areas, which provides a secondary source of dissolved phase contamination through desorption, often resulting in asymptotic concentrations above the clean-up target and/or rebounding concentrations after switch-off (Figure 2). This can result in rising costs, excessive project lengths and an uncertainty of success. 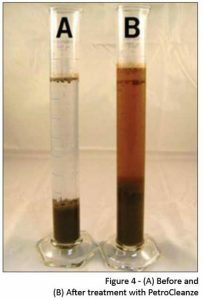 Regenesis’ PetroCleanze® technology can be used to enhance the performance of physical abstraction systems by increasing the amount of contamination abstracted and reducing the mass left adsorbed to the soils. It does this by temporarily increasing the desorption of adsorbed contamination, which can then be removed by the existing abstraction system. 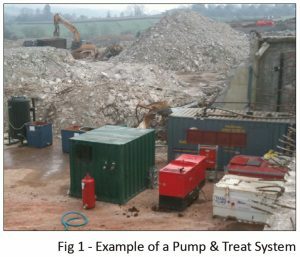 One or more inexpensive applications of PetroCleanze act to reduce the time required for a pump and treat (P&T) system to be operated, decrease the asymptotic concentration to allow remedial targets to be met, and lessen the likelihood of rebound following shut-down. PetroCleanze is an evolution of RegenOx, Regenesis’ in situ chemical oxidation (ISCO) technology which made ISCO safe and accessible, and is now used worldwide, including every one to two working days across Europe. PetroCleanze is a two-part product, comprising a powdered sodium per carbonate oxidant and Regenesis’ platform catalyst technology, adjusted to enhance the desorptive impact on organic contaminants. Both parts are simply diluted, mixed together and injected into the subsurface where the abstraction system is operational. The desorption effect of PetroCleanze is the result of several processes. The silicates from the catalyst promote a surfactant effect, lifting the contamination off the surface of the soil. This, assisted by a temporary increase in pH, further supported by the carbonates in the oxidant, helps mobilized adsorbed contamination from the soil surface. The direct, free- radical and surface-mediated ISCO provided by PetroCleanze produces a disequilibrium between the groundwater and soil contamination, encouraging desorption. The partially oxidised organic species produced by ISCO are also more soluble and so a greater proportion will exist in the dissolved phase from which it can be removed. Further ISCO of these organics results in the creation of polar molecules which then act as co-solvents, and also saponification reactions through the oxidation at high pH. Both processes support the removal of further adsorbed contamination from the soil. The contaminant itself is transformed to become more extractable and tomake further contaminant mass available to the abstraction system. In this manner, rate and extent of contaminant recovery are greatly enhanced. In the past, organic surfactants have been tried to augment P&T systems, but have been found to block pore-throats and leave a residue, which acts as an extra oxygen demand impeding any follow-on biological degradation. PetroCleanze avoids these issues by being entirely inorganic, and even enhances natural attenuation by increasing the Redox potential of the groundwater and, through ISCO, leaving the residual mass more bioavailable and biodegradable. and soil contamination) is available for physical abstraction. This would make a P&T system much more effective, remove more contamination at less operational cost and reduce the likelihood of rebound. PetroCleanze has become widely used across the worldwide brownfield sector; enhancing a wide range of existing abstraction technologies including P&T, Multi-Phase Extraction and Soil Vapour Extraction. It is also being used in locations where fixed abstraction systems are impractical or undesirable; where an application of PetroCleanze is followed by extraction using a vacuum tanker. 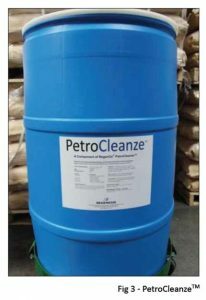 The following three case studies provide an illustration into where and how PetroCleanze is being used to improve physical remediation systems.